Wasp Season - trapping wasps! It seems that in years when there is a long wet springtime, the breeding conditions for wasps are ideal. 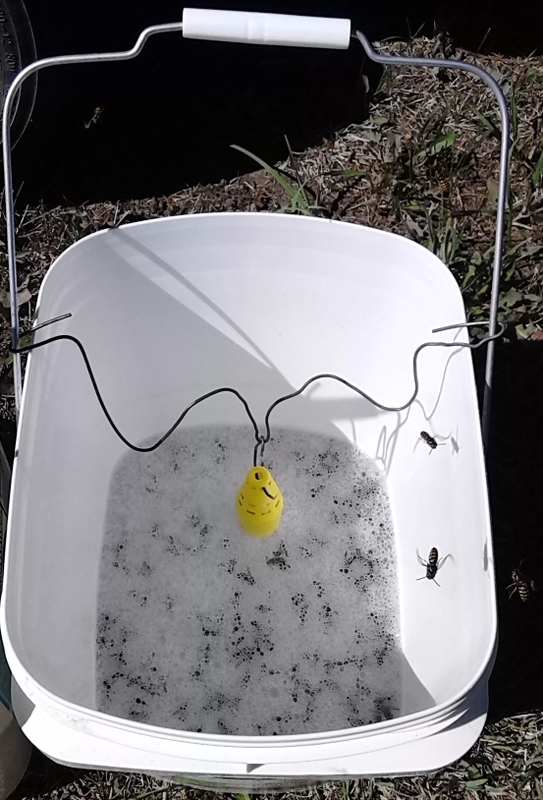 To begin each and every season as a successful wasp trapper, one must set traps early in the spring in an attempt to trap the Queen wasps. NOTHING can help more than this, to eliminate the number of wasps later in the year by eliminating the source of those wasps earlier. Early traps will NOT catch a large number of wasps, but WILL catch the Queen wasps. Setting your traps in mid-March to early April is an optimum time for Queens to emerge and find your traps. What exactly is a wasp trap? What does it look like, how does it work, and where can I find one? A wasp trap is a device used for trapping wasps; it may be purchased, or home made. There are many devices available on the market, but the author selected the Rescue brand trap for his own preference. Recognizing the wisdom of providing a warning to those inclined to ignore the fine print, the author has copied the warning from a Rescue product for your review and protection, below. The author is NOT officially endorsing Rescue, nor is there any benefit to the author for doing so except that the author believes in crediting his sources. The author has in fact placed half a dozen traps within 12 inches from each other, and can affirm that all traps catch a lot of wasps, and that there are many more that are not caught. So, you ask, why set the traps at all? Think of it this way: if you never play the lottery, you will never win the prize. If you don’t set the trap, you will never eliminate the wasps (ANY of them). But there is something else going on here, too; the author has noticed that although he might not be catching ALL of the wasps, the majority of wasps in the vicinity are in fact buzzing around the traps. They might not be actually caught (yet), but they are not flying around looking for something new; they seem to think they have found Nirvana, even if they have not yet figured out how to enter it. The package contains a sealed cartridge that fits perfectly where the cotton rested in the original trap. The cone is designed to provide a pheromone attractant that will last for approximately ten weeks. In addition to the longer time advertised, the author has found an excellent way to extend that time for several more weeks. More on this below, under homebuilt traps discussion. OK, so the trap has been placed in a suitable location. Now what? Depending upon your specific conditions, it may take several days before the trap needs to be emptied. 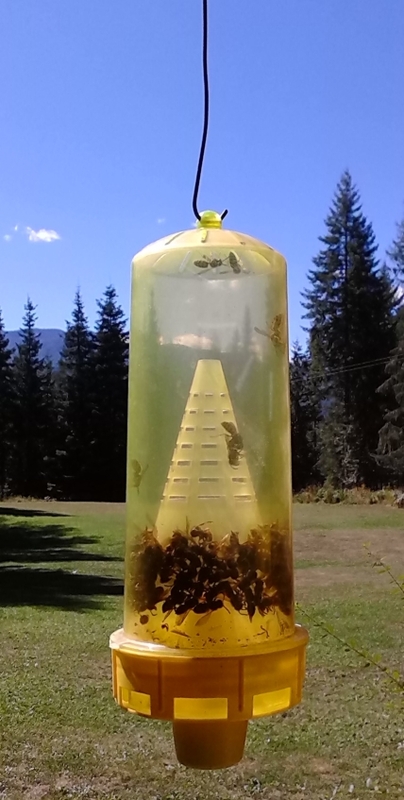 You will see from the picture of the trap that there are both live wasps buzzing about, and dead wasps accumulating at the bottom of the trap. Although this depth can grow to several inches, up to the top of the center cone, the author finds it easiest to clean the trap after a couple of inches have accumulated, usually the result of three to four days activity. The trap you see pictured is due to be cleaned out. Cleaning the trap. In the evening the wasps are still settling down, and becoming somewhat sluggish but still alert enough to be aroused. In the early morning those wasps that lie dormant are waiting for the cool of the evening to pass before they awake and resume their hunt for Nirvana. The author has found the following procedure to be effective in both evening and morning and possibly mid-day as well. Take the trap down and lay it in a freezer. Given enough space, multiple traps can be handled in this manner. This process places the wasps in ‘hibernate’ mode, where they will remain through step 4 and will not cause you any discomfort. Wait 10 minutes, then take the trap and unscrew the bottom, exposing the cone attractant. Set the cone attractant and base aside. If any wasps remain in this area of the trap (they will be hibernating), tap the side of the base dropping them in the toilet. Over the toilet, open the trap by unlocking the cone (pressing the two tabs so as to loosen the cone). The wasps will tumble into the toilet bowl, and any remaining in the trap can be brushed out with the tip of the cone. Wash/rinse the trap with clear cold water, replace the cone in the base and screw the base back into the trap. That pretty much sums up what a trap is, what it does, and how a commercial trap can be set up. What about making one for yourself? Homebuilt Traps: There are many varieties of these, and probably many ways to construct them. The author has seen bottles with apple juice, hamburger, hot dogs, etc., used as an attractant, along with many type of openings cut into milk bottles, pop bottles, etc., etc. Taking a piece of wire about 20” long, form an open loop on both ends. This is used to suspend the bait in the bucket. Bend the wire so it hangs in a ‘V’ in the bucket, the ‘V’ about 8-10” above the bottom of the bucket. The open loops permit slipping the wire on and off the handles of the bucket. Take a smaller length of wire, about 4” long, and form an open loop on one end. Bend the wire so as to form a “J” hook on the other end. This hook is used to suspend the bait above water. Place a few drops of dishwasher soap in the bucket container. Add about 3”-5” of water to the bucket. Prepare the bait for the trap. The author has used hot dog pieces, bacon, turkey strips, and all of these are good for a day, 2 at most. The best thing found has been those old cones, which seem to have lost their attractant draw after several weeks. These cones make good bait for days and days, so don’t discard them if you choose to make a home built trap such as this. Place the wire with the ‘V’ in the bucket containing the water. 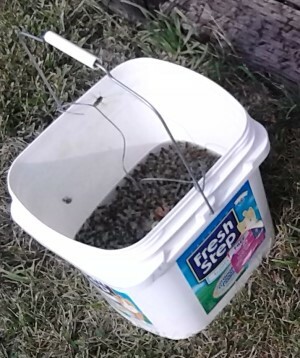 Set the bucket on the ground in some location where the wasps are active. Slip the baited ‘J’-hook wire in the ‘V’ of the wire suspended in the bucket. The bait will be suspended above the water an inch or two. CAUTION: Due to the extreme effectiveness of the attractant, use caution when placing and maintaining traps. Place and maintain traps in late evening or early morning when yellowjackets are less active. 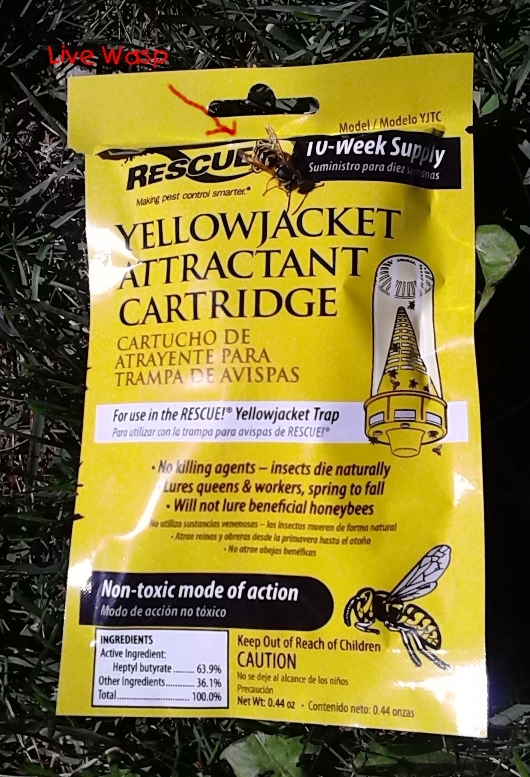 People allergic to yellowjacket stings should allow others to place and maintain traps for them. Yellowjacket stings can be fatal. Storage: Store in a cool, dry, well-ventilated location out of reach of children and pets. Disposa: Deposit in trash for collection. Wash hands with soap and water. About the author: The author lives in the Idaho Panhandle, and wrote this article because of the extreme number of wasps in the fall of 2013. Based on anecdotal input and trial and error, the author relates the result of his experience in an attempt to catch every wasp within a 5 mile radius of his home. He was not successful in the attempt, but he did remove thousands of wasps from his immediate vicinity. Unfortunately, Mother Nature creates tens of thousands of these insects every season. The author can honestly state that he was not stung, not once, so as far as he is concerned, the score is thousands to zero. At least, that is the score at the time of publication of this article.